Parkview Hall, built in 2013, serves as a hurricane evacuation center for the FIU resident student population, and meets building occupancy standards for a Category 5 hurricane. Stephen Jagassar had a problem. With Hurricane Irma roaring through the Caribbean and appearing to be on a collision course with South Florida, the freshman marine biology major from Queens, New York, had to decide whether to stay or go. Jagassar lives in Bayview Student Living at FIU’s Biscayne Bay Campus and, along with the other residents, was forced to evacuate with the storm drawing closer. With flights home costly and beginning to become cancelled and not enough time for his sister to come down to Miami from Orlando and drive him north, he decided to ride out the storm at FIU. 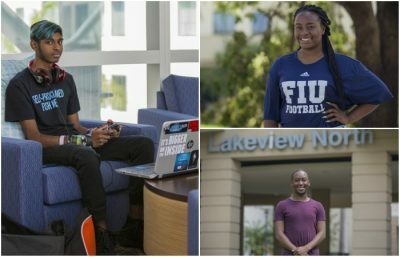 While many student residents chose to seek shelter off campus, Jagassar and several hundred other residents stayed at Parkview Hall at MMC, which serves as a hurricane evacuation center for the FIU resident student population and meets building occupancy standards for a Category 5 hurricane. Hurricane Irma marked the first time the building was used in such a capacity. While it was the only option for Jagassar, staying at Parkview was the best option for freshman biology student Kaelin Berthold. The Panther Hall resident felt that staying at FIU was the safest place for her to be. Chris Downs, a junior broadcast journalism student and a residential assistant at Lakeview North, and his colleagues were tasked with helping keep residents calm and reassured before, during and after the hurricane. While many students from Florida may be accustomed to hurricanes and close calls, this one was the first for many out-of-state students. “We just took it one day at a time and tried to, strategically, make decisions that will help us get through the storm,” Downs said. 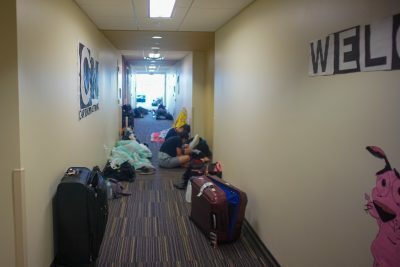 Many student residents had to spend most of the hurricane in the hallways, the safest place to be in the middle of a hurricane. 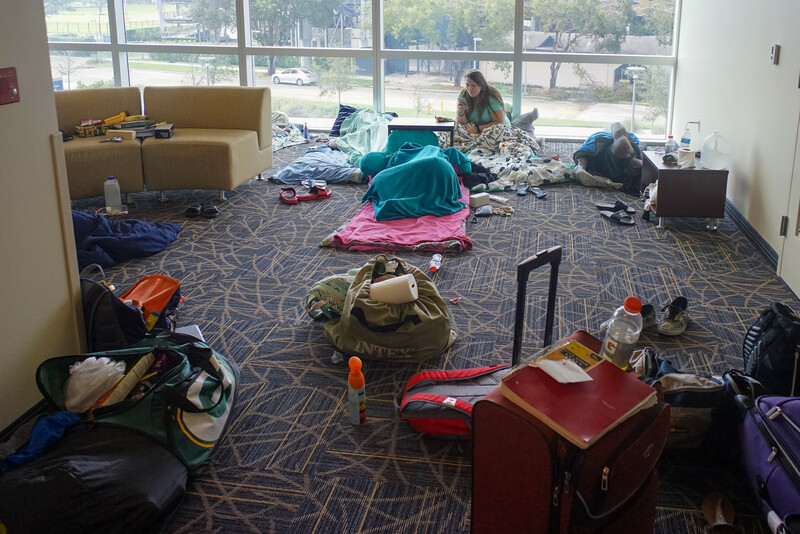 The students spent more than 48 hours inside of Parkview, much of the time huddled in hallways away from the hurricane-proof windows as Hurricane Irma’s stormy conditions raged and lingered over Miami. To pass the time, the students, residential assistants and other housing and residential life personnel blasted music in some areas and played board games like Monopoly or card games like Uno in other areas to keep their mind off of the storm raging around them. “Hearing the rain up against the window and seeing the trees in the wind, it was pretty scary at times,” Berthold said. For several brief minutes Parkview lost power, but it was a temporary inconvenience as the facility’s generators kicked in and provided those inside with electricity and air conditioning for the duration of the hurricane. In a way, the opportunity to stay on campus during Irma helped forge new friendships and strengthened already existing ones for both Jagassar and Berthold. Stephen Jagassar (left), Kaelin Berthold (top right) and Chris Downs were a few of the hundreds of students who weathered Hurricane Irma at Parkview. After the hurricane many of the residents, including Berthold, were able to return to their rooms and are trying to get ready for their classes, which resume on Monday, Sept. 18. But Jagassar and the other Bayview residents have not been able to return to theirs as FIU staff attempts to clear and fix some of the damage done to the facility during the storm. In the meantime, they have had to make the residence halls at MMC a temporary home and hope to return to BBC before the end of the weekend. “We have a room, a fridge, air conditioning and electricity, which a lot of people don’t have, so we feel very fortunate,” Jagassar said. All in all, Jagassar knows it could have been worse. Much worse.